L. E. Waterman's early pens were "eyedroppers"  collector's jargon for pens lacking a filling mechanism, that have to be opened and filled using an eyedropper. Although self-filling fountain pens had been made in small numbers since at least the beginning of the 19th century, eyedroppers were the norm until the 'teens of the 20th. Waterman's eyedroppers fall into five main categories: straight cap (where the cap is the same diameter as the barrel, and fits on the section); taper cap (like the straight cap, but long and tapered); cone cap (where the cap is larger than the barrel, and fits over it); screw cap; and safety (with a retractable nib). All of these were offered in a broad range of sizes and trim, as well as with various kinds of precious metal overlays. The most common Waterman eyedropper by far is the basic, utilitarian 12  a cone cap pen with a #2 nib (the same pen but with a #4 nib  a 14  is pictured at the top of this page). Safeties and screw cap eyedroppers are somewhat less common, while taper caps and straight caps are rather rare, especially with nibs larger than #4. While for most collectors eyedroppers are primarily of historical and aesthetic interest, they are also eminently functional writing instruments. The messiness of manual filling has often been exaggerated, and nothing can beat an eyedropper for simplicity, robustness, and ink capacity. Many have wonderfully flexible nibs  far more, proportionately, than pens from later eras. Above, from top to bottom: a slender "Secretary" 12 1/2 cone cap pen, c. 1900-20; a 22 taper cap, c. 1900-15; a 2 straight cap pen, c. 1898. All of these pens are made of black hard rubber. 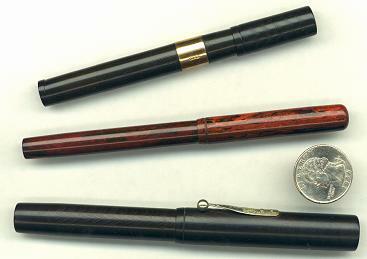 Below, from top to bottom: a 42 safety with retractable nib, with 9K gold applied band, c. 1920; a 12 cone cap in mottled red and black hard rubber, c. 1900-10; an 18 cone cap, the second-largest size offered, with a #8 nib, c. 1900-1914. The pens illustrated above and below are not to scale.